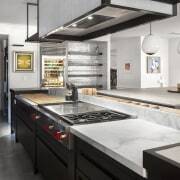 In this unfitted design, each element in the kitchen is a character piece – such as the oversized, custom made stone sink. “I wanted an organic design with a handmade feel rather than something that looked as if it was made by a robot,” he says.And the layout, size and scale, selection of materials and references to the past all contribute to an end result that’s far from predictable. 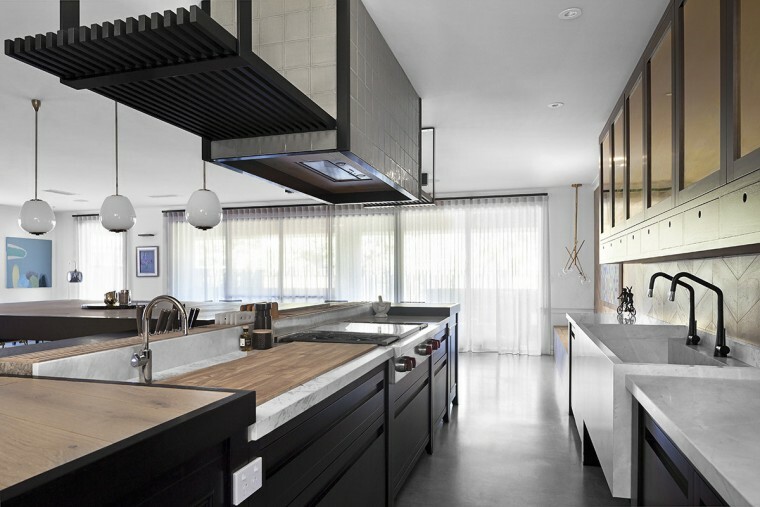 “I didn’t want everything to be too built-in, so it’s more of an unfitted look, like the freestanding furniture pieces in kitchens by English designer Johnny Grey,” says House The central island is a case in point. At 5m long it could have over-dominated the space. But by varying heights and materials along its length and adding furniture-style feet, it has a more balanced scale and proportion. “It’s using unfitted design without drawing attention to it, so when you look at each piece, it’s got its own character. ”The same approach was taken for the kitchen components on the wall behind the island, where there are more references to the past. 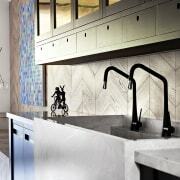 Custom made from dolomite stone, the huge kitchen sink is 1500mm long, 600mm wide and 450mm deep in the middle.“It’s like an old concrete laundry basin. It’s deep enough so water doesn’t splash out, plus you can easily stash dirty dishes in there out of sight before clean-up. 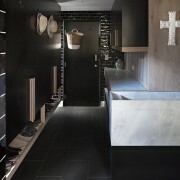 ”Above this back benchtop is a practical arrangement of cupboards and drawers, but again with a point of difference. “Instead of glass in the cabinet doors, I’ve used brass – something I remember seeing in my grandmother’s kitchen.”In between the sink bench and overhead cabinets is another unusual touch. 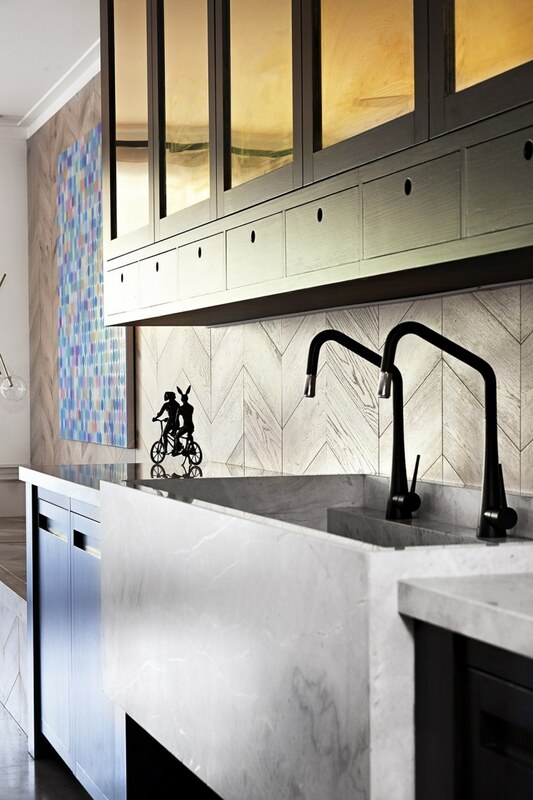 The splashback is pre-finished timber floorboards installed in a Chevron pattern. House says the boards are ideal here, being both waterproof and hardwearing. 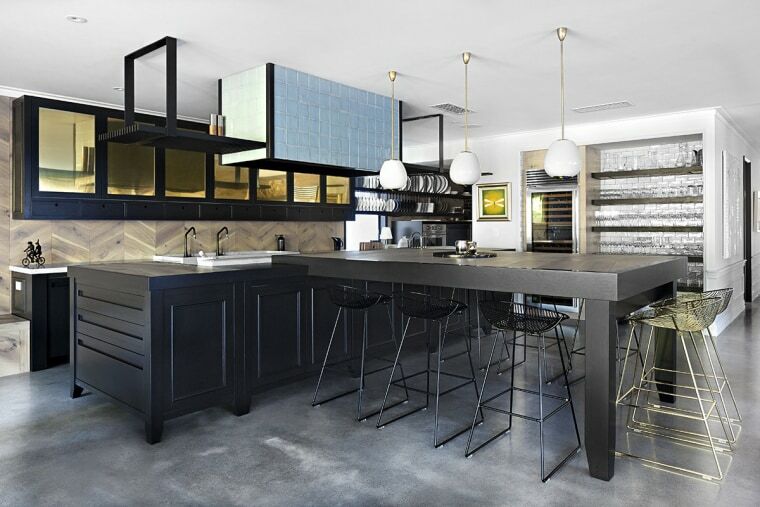 Meanwhile, set at right angles in front of the island is an oversized table that also functions as a bar and gathering place when guests first enter this social kitchen.